This week's Tuesday Treasure is the 1876 naturalization record for T.S. [Torger Sjursen] Leland of Deerfield, Wisconsin. whereof he was before a subject. to become a Citizen of the United States. T.S. 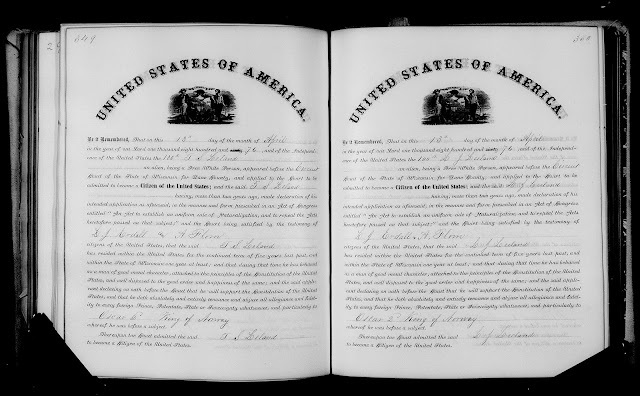 Leland, Certificate of Naturalization, Page 349, Volume 10, Dane County (Wisconsin) Circuit Court; Naturalization Records, 1841-1954; Wisconsin Historical Society Archives, Madison, Wis.
Torger Sjursen Leland (1850-1933) was the son of Sjur Torgersen (1804-1889) and Brita Olsdtr (1818-1895), and the grandson of Torgeir Olsen (1753-1827) and Anna Sjursdtr (1772-1826). Torger Sjursen Leland was born in Molster, Voss, Norway, and Sjur Torgersen was born in Tungeteigen, Voss, Norway. The second naturalization record on the image above is for L. J. Leeland with the same, date, the same witnesses, and the same King of Norway. I don't know for sure who this L.J. Leeland is. I think he may be Lars Johannesen Erdahl (1839-1912) who married Anna Ivarsdtr Liland (1839-1922); Anna Ivarsdtr Liland was the daughter of Ivar Torgersen (1812-1893) and Kari Larsdtr (1820-???? ); Ivar Torgersen was the son of Torgeir Olsen (1753-1827) and Anna Sjursdtr (1772-1826). Ivar Torgersen was born in Tungeteigen, Voss, Norway also. Therefore, Torger Sjursen Leland and Lars Johannesen Erdahl were first cousins, and their fathers were brothers. Kari Larsdtr was born on Liland farm in Voss parish in Hordaland in Norway, and the Sjur Torgersen and Lars Erdahl families took the Leland in name in about 1876. Torger Sjursen Leland married Anna Ellingsdtr Natvig in 1876 shortly after he became a U.S. citizen. Torger and Anna (Natvig) Leland are my wife's great-grandparents, through their son Severt Oliver Leland (1878-1940).